Last night I dreamed of taking a job in the social work department of a mining company. 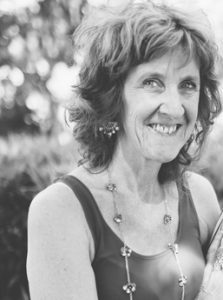 I did not reflect upon the juxtaposition of social work and mining at the time, only knew that I was happy to have a job. A reliable income at last. And as I write the word ‘reliable’, I wonder did my dream have anything to do with the reliability that has at last been restored to my life with my husband back home and the dramas of the past seven weeks subsiding. All the tests the doctors took at the last minute were negative, except there are still signs of the infection dangling under its cosy biofilm on his pacemaker lead, though much reduced in size. Despite all the original threats to remove the pacemaker and thereby jeopardise my husband’s life to save his life, the medical Brains Trust saw fit to leave well enough alone and they sent him home on oral antibiotics, apparently for life. My husband is accustomed to taking pills for life as long as there is life. He does not have the dreaded temporal arteritis, our fear for last week, and all other signs have returned to normal and so he is back in the fold and life resumes some semblance of normalcy. Why then I wonder as my dream progresses do I find myself spending several days unready for work, and in need of a shower, chatting to my colleagues at the mining company and helping them with their children? Why then in my dream, do I find myself accosted by a senior official who questions my qualifications within the mining sector. The official is right but I also believe I can get by once I become accustomed to the procedures. I can find a way to help, perhaps with the mothers’ groups and I tell the senior official as much but she hauls me off to the director’s office and there the two decide together I am unfit and should leave the place immediately. I’d have thought I’d be more upset in the dream and although I dislike my capacity being questioned in this way, I’m relieved to be on my way. There will be other jobs, I tell myself at the same time hovering in the back of my dream, I know it’s only a dream. And then to wake on Good Friday morning into the quiet of this particular day of the year, my favourite day of the year in so far as it seems like, almost everything and everyone stops, irrespective of their religious convictions – in this country at least. It’s not the religious part that matters to me, though no doubt it fuels my memory. My mother’s belief that every Good Friday at three o’clock in the afternoon, the sun won’t shine. She forgot there are many places in the world in darkness and other places where the sun must be shining brightly, even on Good Friday. My mother’s belief in her religion belonged to wherever she found herself, a convenient belief as far as I could see. The way the world always looks better when you’re in a good mood and when you’re not, your world can suddenly seem awful. 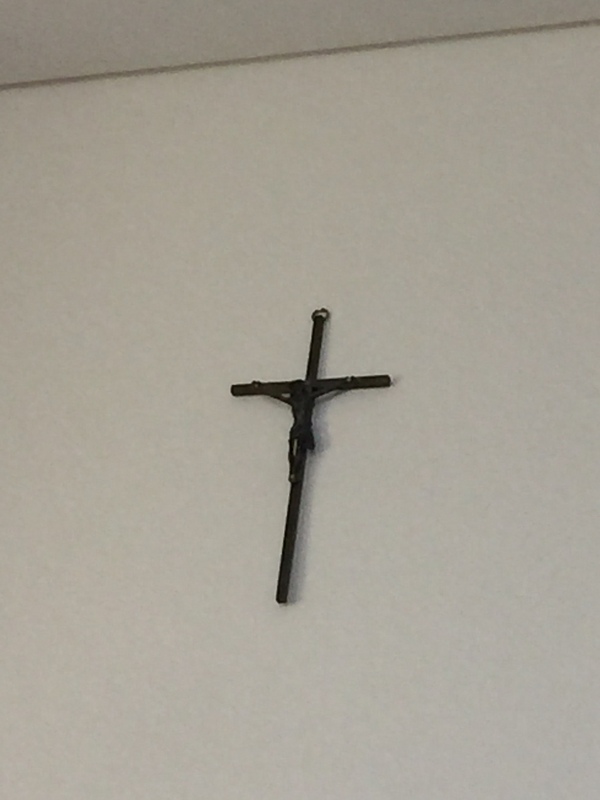 The cross on the wall of the hospital where my husband spent the last seven weeks. No rising from the dead but at least a chance to go on living. My world has improved remarkably with my husband home at last. I am not so foolish as to believe it will go on forever. Nothing lasts forever. And change is the one great certainty, but for now I can rest on the possibility of some time out from the routine of hospital visits and life on a medical ward. The world looks different outside the hospital prison, however necessary time inside may be. There were a couple of times in my last job where my honesty and ability were questioned. And I was SO offended. Hurt even. Devastated actually. As I’ve mentioned before my dreams often have work-based settings, sometimes places I’ve worked or othertimes imaginary work settings populated by people from my past. There’ve been dreams where I’ve had difficulty in solving a problem but none where my capability or trustworthiness were EVER in question. I was the kind of guy who arrived for work an hour early, took work home at night and was even known to come in at weekends. Work mattered to me and being good at my job—being the best, irreplaceable—was what defined me. You don’t question a guy like that’s work ethic. It’d never happened before. I was renowned for my conscientiousness and industriousness. So as far as I was concerned if I said something was so that should’ve been good enough. But we live in a world where people are lazy and deceitful. There was a problem with the phones when I was working in the warehouse—basically they never stopped ringing—but rather than take my word my line manager came and sat in the office so he could see for himself. What did he think I was doing? Well I know what he thought and that was the problem. I took it personally. The second time HIS line manager sat beside me all day and watched me work to try to get a better idea what my job involved. Fair enough. But she questioned every little thing I did. Later, after I’d left, she explained why she’d been doing it—how can you effectively manage if you don’t understand what you’re people do?—but she never explained that to me at the time. All she did was nit-pick. It wasn’t long after that—days as I recall—I walked out and other than to leave Xmas presents for those I cared about (her included I should add), to clear my desk and drop off my keys (which I did out of office hours) I never went back. Had I been in a better place mentally I would’ve got over it but the state I was in by then—through years of overwork—all I needed was an excuse. Glad to see your husband’s back home. Never heard of antibiotics for life. I thought they were courses you took for a couple of weeks. There’s been a lot about antibiotic-resistant bacteria in the news of late. I find it all a bit frightening. The latest thing I read about are bacteriophages; they’re apparently type of virus that infects bacteria. The miracles of modern science, eh? But how long with they be good for? Makes me never want to leave the house again. Sounds like you were a conscientious worker, Jim and sad that it did reward you as much as it might, at least in the long run, though no doubt it’s paid off with your writing. On that other note, antibiotics may have their drawbacks but at the same time it’s clear they save lives. Thank goodness for penicillin and all its derivatives. Though while my husband was struggling wth those regular infusions I might well have cursed them. Not any more. Thanks, Jim. Dreams can be weird things. I just dreamt I witnessed a nuclear explosion with Carol Burnett (an American comedy star.) God knows what that was about. Now that’s some dream, Kirk. I remember Carol Burnett and I suppose she came from the nuclear era. I wonder what she represents for you. Something explosive going on in your life? Thanks for your support Kirk. Such happy news that your husband is back home with a semblance of normality returning. I am sure he will beat the last of the annoying bugs. He has always come across as quite a resilient character in your writing. I once mused with a doctor that if I ever needed to take medication on a permanent basis he might just as well shoot me because I could never remember to do it. He replied, ‘If your life depends on it, you’ll remember.’ I do. I have just been forced into retirement because my work ability, after 12 years, was questioned and I was not prepared to put up with the humiliation of being ‘supervised’ and the process that it entails. Of course, it has nothing to do with my age, because we all know that ageism is not condoned. Hmmm . . . . then why is my colleague of a similar age also being subjected to ‘bullying’ tactics. Oh, that’s right, bullying is not condoned either. Grrrr . . .
Now, at least, I can get on with all the things I planned to do before work got in the way. It’s horrible to hear you were been forced out of your work, Karen but so good to hear you’ve found alternatives. Ageism and bullying are cousins these days. Along with all the other abuses perpetrated on people – whoever they are – who are vulnerable. And yes, it’s lovely for me to have my husband back home and no longer having to make those endless trips to the hospital. For him, it’s a treat/relief to be home and, yes, he’s resilient but of course it’s going to take a while for my husband to get back his old strength. Thanks, Karen.